Watch SplitSuit's Baby Pairs video for 33 minutes of strategy dedicated to playing small pocket pairs. 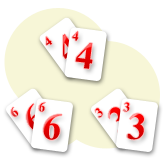 Small pocket pairs range from 22 to 66, where any other higher pair would be considered to be a medium or high pocket pair. These low pairs are deceptively strong, and will often land novice players in a lot of trouble if they are over-valued. A small pocket pair is usually regarded as a pair between 22 and 66. A small pocket pair is ahead of the majority of other hands pre-flop as long as an opponent does not hold a higher pocket pair. However, post flop play can be incredibly tricky if our hand does not improve. The biggest problem with small pocket pairs. When holding a small pocket pair, there is a very high chance that the flop will bring over cards. This will then give us an underpair to the board, and it is going to be very difficult to try and find out whether or not we are ahead. If we make a bet and get called, this gives us little information in whether or not our hand is ahead. Our opponent may have a higher pair, a drawing hand, a lower pair or any other possible hand. The simple bet and call does not tell us a lot about what our opponent is holding, and it will prove to be costly to try and find out if we are ahead by betting on the turn and river. Small pocket pairs and sets. The true strength of a small pocket pair lies in when they improve to make a set on the flop. A set is when you make 3-of-a-kind on the flop with a pocket pair, which is different to trips, where you make 3-of-a-kind using one holecard and two cards from the board. A set is a very hidden and strong hand, and it is possible to make a lot of money from them when they hit because opponents will not often suspect them. Find out more about the different types of 3-of-a-kind hands in my article on sets and trips in Texas Hold'em. So instead of looking to play small pocket pair after the flop to try and find out if we are ahead, we should just be looking to hit a set or fold. It is not very profitable and it is very difficult to play a low pocket pair post-flop if it does not improve, so try to avoid doing so. With small pocket pairs, the best strategy is to aim to make a set on the flop and play on, or fold if you do not hit a set. Pot odds and mathematics of hitting a set. The odds of flopping a set with a pocket pair are 7 to 1, which means that we will hit a set 1 in every 8 flops we see. These odds are not too great, and according to pot odds it means that we will rarely be getting good enough odds pre-flop to call to see a flop and try and make our set. The pot odds basically suggest that we will be paying too much for something that will not happen frequently enough to make it worth our while. But, there is something very important that we are leaving out of the pot odds equation, and that is the implied odds we have from hitting a set. Implied odds make playing small pocket pairs worthwhile. The implied odds are how much we expect to win after we make our hand, and I can tell you now, the implied odds we have for sets are HUGE. It is not uncommon for players to lose all their money to sets if they catch a decent part of the flop, because they very rarely suspect that their opponent has one. Set strategy and how to play small pocket pairs. The opponents should have relatively deep stacks. About 70BB+ should do the trick. I would avoid calling raises over 7BBs to see a flop. 1) Play small pocket pairs against deep stacked opponents. The deeper our opponent's stack the better. This is because we are not going to hit a set too often, but when we do we want to have the opportunity to be paid off handsomely. If our opponent has a small stack, the reward for hitting our set and getting all-in will not justify calling raises when we are only going to hit a set 1 time in 8. The deeper the stack, the greater the implied odds, the greater the potential reward and the more +EV calling to hit a set becomes. You can find out a little more information on this sort of topic in the article on stack to pot ratios. 2) Be happy to call up to 7BB raises preflop. The bigger the preflop raise, the worse the pot odds are and the less profitable calling to hit a set becomes over the long run. The standard preflop raise however is about 3 or 4 BBs, which is fine for calling in an attempt to hit a set. However, our implied odds after hitting a set are huge, so we can afford to pay a little more to see a flop. Therefore, as a general rule, I would recommend calling up to 7BB raises before the flop, simply because we can expect to get paid off pretty handsomely when we hit our set. Don't be afraid to call up to 7BB raises (or possibly a little more depending on the situation) with a small pocket pair. It may seem like a lot, but the returns are huge when you hit a set. Advanced small pocket pair strategy. If you have a strong post-flop game, it can work to your advantage to raise with pocket pairs before the flop. This will give you the initiative in the hand and help you to take down a few extra uncontested pots along with the bigger ones when you hit your set. However, if you a beginner player just getting to grips with small pocket pairs, it will be easier to take the more passive route of just calling before the flop as opposed to raising. Both methods are profitable, so go with what you feel most comfortable with. Raising preflop with small pocket pairs will be more +EV, but that's only if you know what you're doing. I've already covered this point, but I want to stress the importance of stack sizes one more time to really drive it home. If our opponent has a short stack, our implied odds will decrease greatly because there is going to be less for us to potentially win when we hit our set. Similarly, if our opponents have big stacks then we are getting terrific implied odds for hitting our set. The smaller our opponent's stack is, the lower our implied odds. The bigger our opponent's stack is, the greater our implied odds. This means we can give ourselves a little more room to work with when calling raises pre-flop; if our opponents have short stacks we should avoid calling raises and try to get in as cheaply as possible or not at all, whereas if our opponent has a big stack then we can afford to call a little extra more to try and hit our set because of the good implied odds. How to play small pocket pairs evaluation. As you probably noticed, the strategy involving playing small pocket pairs centres primarily around the concept of implied odds. The implied odds explain the reasoning behind the small pocket pair strategy, so you should try and familiarise yourself with them. The whole article basically elaborated on the basic strategy of seeing cheap flops with small pocket pairs, and then only continuing with the hand if you hit a set. If that is the only thing that you take away from reading this article, then don’t worry, as you have probably helped save/earn yourself a lot of money in the future from that alone. Don't be afraid to call big raises before the flop with small pocket pairs, but be prepared to let them go if you do not hit that set. It's a simple yet effective strategy with any pair between 22 and 66.